All Glem cookers are approved to be built into your kitchen cabinets according to the European Built-in Homologation (UNI EN 30-1-1 class 2). No space required between the bench and the cooker. The fan operates without heat. It provides effective defrosting in half the time. The full glass oven inner door grants stength and solidity and it also faciltates the cleanliness since it is completely smooth. This is a new arrangement of the burners. We have positioned the triple ring burner (3,6 kW) to the left. The overall functionality of the stove top is perfectly optimised. Even when using a 30 cm diameter pan on the left burner, there is enough clearance for other pans to be used on the other burners. The one-hand ignition allows to ignite the cooker through an easy pression of the knob. Essential design for ease of use. The smooth inner part of the oven door gives not only a clean look it makes cleaning so much easier. The glass window is easily removable to allow the cleaning of the internal glass. The Operational surface temperatures are reduced thanks to an innovative induced tangential cooling system. Tangential cooling means the oven remains cooler on the outside, to avoid heating the kitchen furniture or forming condensation. The tangential fan at the top of the oven starts up automaticallya few minuters after the oven is turned on, and a thermostat device ansures it continues to run after the oven is turned off until it has cooled down. Thanks to the low porosity of the titanium enamel, cleaning is so much easier and reduces dirt build up. The titanium enamel is resistant to the attack of acids and maintains its colour over time even after intensive use. It is operated utilizing the oven functions. The heat of the bottom element is spread through the fan. Ideal for soufflés. The fan is operated without any element. It assures rapid defrosting in few minutes and in the best possible way. Allows greater surfaces to be prepared, than with the grill, together with higher power reducing the time required for browning of the food. The grill along with the fan spreads the heat in a homogenous way. Allows uniform roasting at the same time as surface browning. Ideal for grills. Special for large volume pieces, such as poultry, game, etc. 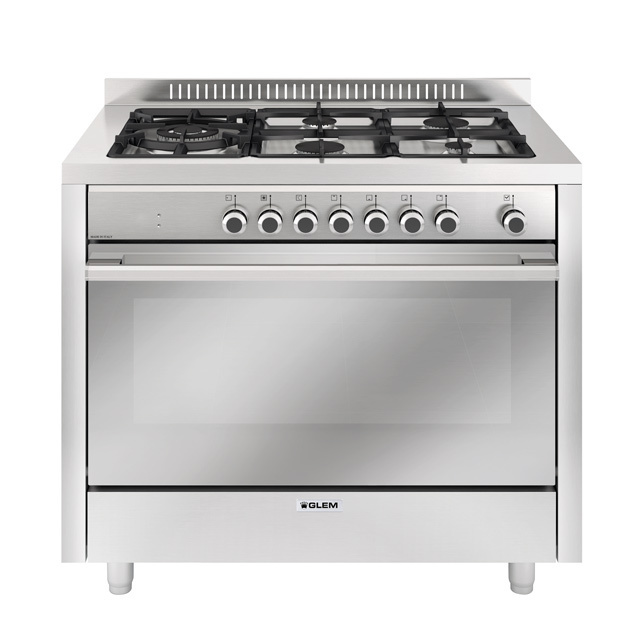 The fan moves the hot air inside the oven, allowing homogeneous cooking on 3 levels, without spreading any smell. 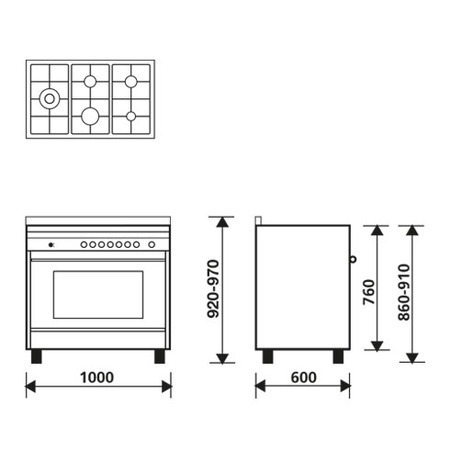 The heat is given by the bottom and upper oven elements. Ideal for pastry cooking and traditional recipes. The company reserves the right to change and update the technical specifications and the pictures at any time, as it deems necessary to improve the product. i.e. the elaboration and processing of data by Glem Gas Spa for marketing purposes referred to under point b) of these guidelines, via the foreseen processing methods, i.e. paper-based, via automated and telematic means, by ordinary or electronic mail, telephone and any other computerised means. i.e. the elaboration and processing of data by Glem Gas Spa for the purposes of profiling referred to in point c) of these guidelines, relating - by way of example and not exhaustive - to consumption and other habits, behaviour, consultation and use of the website. i.e. the communication of data to companies connected to Glem Gas Spa, as well as to partner companies of the same, which will be able to process them for the marketing purposes referred to in point d) of these guidelines, via the foreseen processing methods, i.e. paper-based, via automated and telematic means, by ordinary or electronic mail, telephone and any other computerised means.